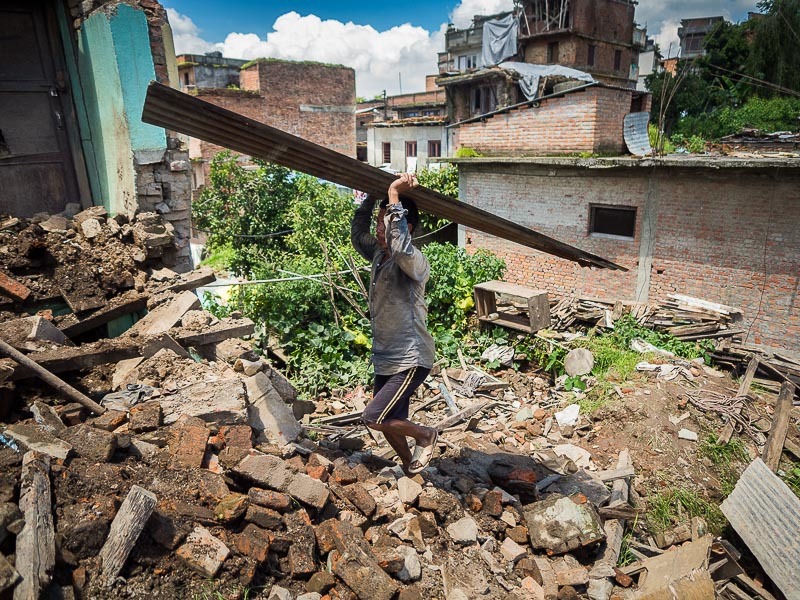 A man carries corrugated metal sheeting up to the wreckage of house destroyed in the Nepal Earthquake. 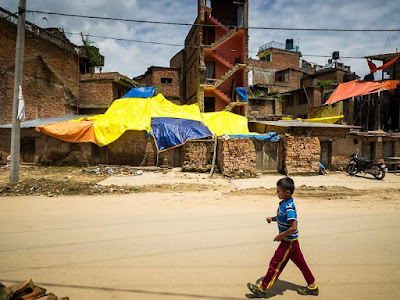 At 11:56 AM on April 25, the earth under the mountainous country of Nepal shuddered and heaved, killing thousands and devastating one of the poorest countries in Asia. The earthquake was an 8.1 magnitude tremor, the worst disaster to befall Nepal since an earthquake in 1934. Workers recover bricks and building materials from what used to be a Buddhist monastery next to Swayambhunath Stupa, a Buddhist stupa that overlooks Kathmandu. Two Buddhist monks were killed when the building collapsed. 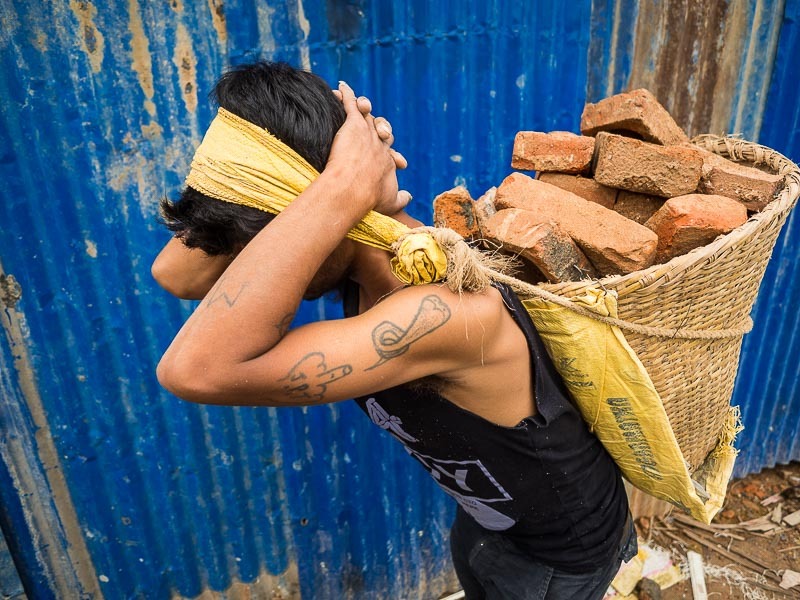 A worker carries bricks away from Swayambhunath. Almost all of the work in Kathmandu is being done by hand. Bricks are dug up by hand, loaded into baskets, and carried to waiting trucks. The bricks are eventually reused to rebuild structures that collapsed in the earthquake. More than 9,000 people died in the earthquake. 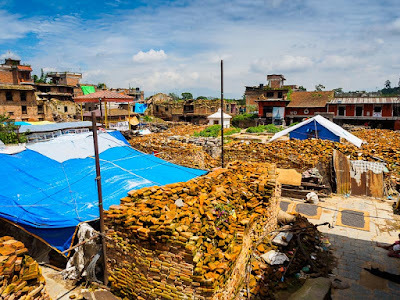 Historic sites in Kathmandu, some centuries old, disappeared in a cloud of dust. The earthquake triggered an avalanche on Mt. Everest that killed at least 19 people. 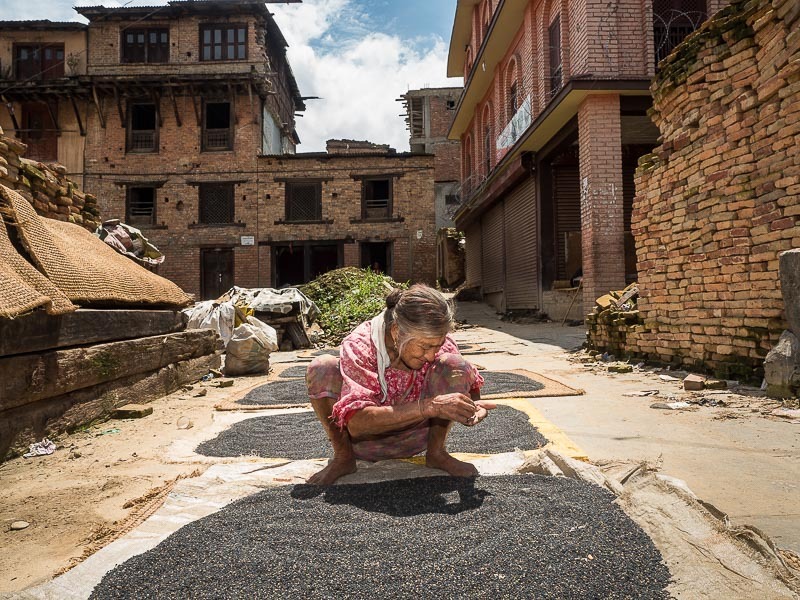 More than three months after the earthquake, tarps still cover a damaged row of houses. The side of the tallest building in Bungamati disappeared. I went to Nepal three months after the earthquake. I wasn't sure what I would see. In some ways it was worse than I expected. In some ways, I expected much worse. 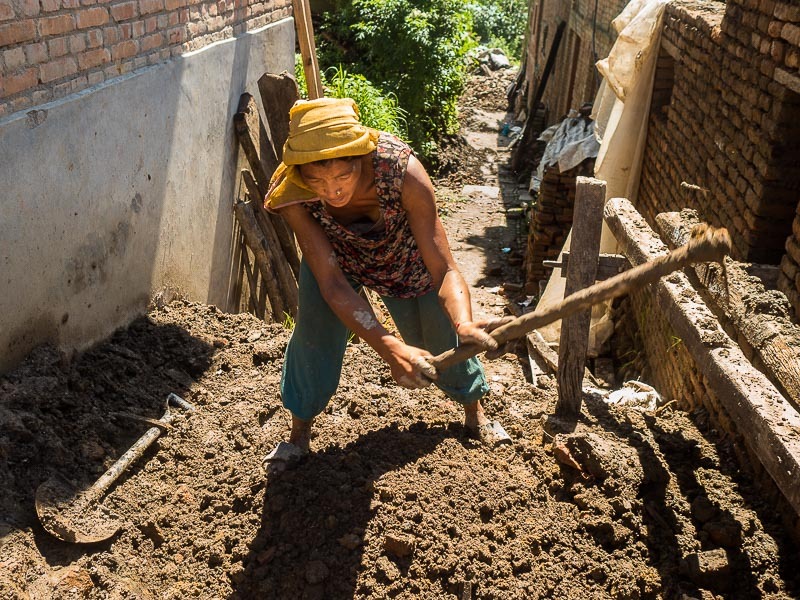 In Sankhu, about 90 minutes from Kathmandu, a woman digs up mud to be used as mortar in a house being rebuilt with bricks reclaimed from the earthquake. Rebuilding has started. Whether in Kathmandu, or communities just outside of the capital, like Sankhu and Bungamati, people are going through the wreckage pulling out bricks and timbers, sheet metal and roofing materials. All of it recycled straight into new homes and buildings. 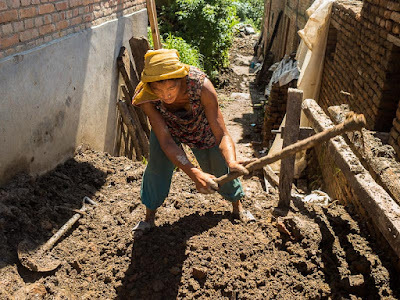 Workers dig up mud (regular mud, not cement) from the streets and use it as mortar in houses rebuilt with reclaimed bricks. Reclaimed bricks are stacked all through the plaza in Bungamati. This used to be the most important Hindu temple in the area. The temple is gone - there is no visible sign of it left. The tents are temporary housing for people left homeless by the earthquake. A woman dried lentils in the main plaza. What struck me about this earthquake was the seeming random nature of the destruction. In Kathmandu, a house on a street would be gone - disappeared in a pile of bricks and mud - while literally next door there was no visible sign of damage. In communities beyond Kathmandu damage is more widespread but even here it's randomness is a thing of both wonder and fear. Three months after the earthquake in Bungamati, workers use their hands and picks and shovels to dig out a street. They pick through the dirt to save anything that can be used in the rebuilding process. People are facing a deadline to get something, anything, done. This is the rainy season and it rains a lot in Nepal. People who lost their homes are living in tents and temporary corrugated metal huts. The tents leak. The rain pounds on the metal, making it like living in a timpani drum. 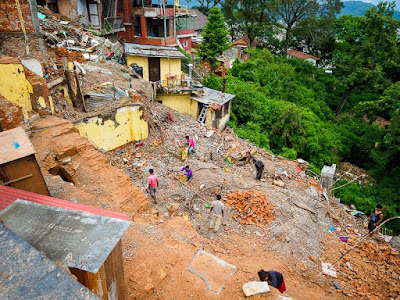 In Khokana people dig through the rubble looking for recyclable building materials. The altitude here is 1,324 meters (4,500 feet). It doesn't snow here but it gets cold. Living in tents in Bangamati, also about 1,300 meters. It's only August, the earthquake happened in April. Winter is coming and Nepal, especially in the mountains, has fearsome winters. People want to be out of the tents and huts before the weather turns. Kathmandu gets cold - in the 40s and 50s Fahrenheit but it doesn't often go below freezing. In the mountains though it is below freezing for weeks at a time with meters of snow. There is a sense of urgency to getting people out of the tents. I expected to see more signs of NGOs and the Nepali government. There was little evidence of either, but I think this has more to do with where I went than a lack of concern. I stayed in the Kathmandu Valley, the administrative heart of Nepal. The damage here is widespread, but this area, served by relatively good roads and close to infrastructure, was the first to get aid. 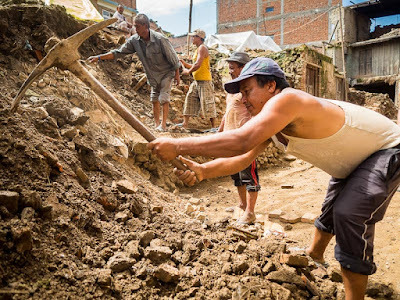 The need is great in Nepal and you might be wondering how you can help. There are a couple of things you can do and a couple of things you probably shouldn't do. The biggest need right now is money. Disaster relief is an expensive undertaking. People need medical care. Homes need to be rebuilt. Roads need to be repaired. All of it needs to be done (or at least started) before winter. The US Agency for International Development (USAID) has a list of organizations working in Nepal; they need your assistance. It seems counter intuitive, but you can visit Nepal as a tourist. Tourism is one of the drivers of Nepal's economy but since the earthquake tourism has withered away to almost nothing. Without exception, every Nepalese person I talked to said the one thing that would help would be the revival of the tourist industry. Even Nepalis who made it through the earthquake are now suffering economically because of the lack of tourists. Tourists coming back to Nepal would provide both a financial and emotional boost. 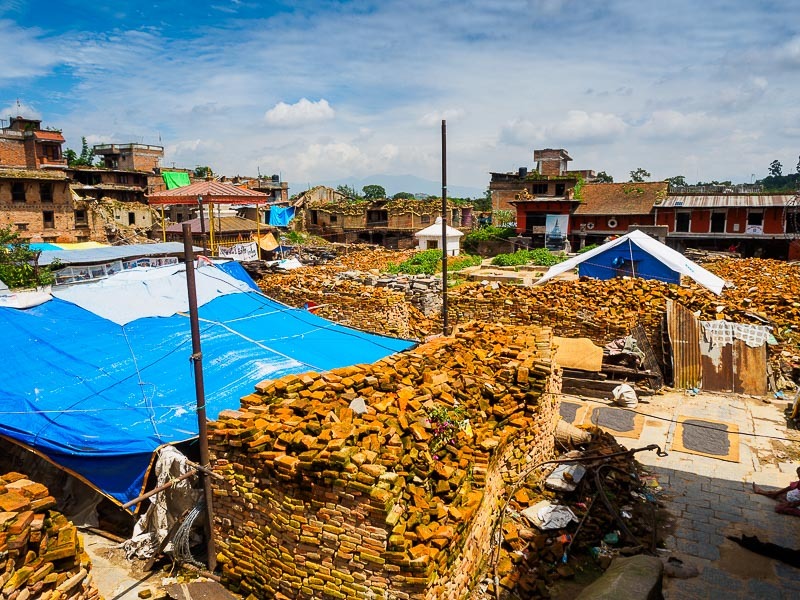 In Kathmandu, some of the historic sites were damaged but many are still open. Most of the tourist hotels survived and are open. The same with restaurants. Thamel, a neighborhood in Kathmandu that is sort of the heart of the tourist industry, came through virtually unscathed. If you have the time and money, travel to Nepal and see the amazing historic sites and experience a culture a millennium older than ours. 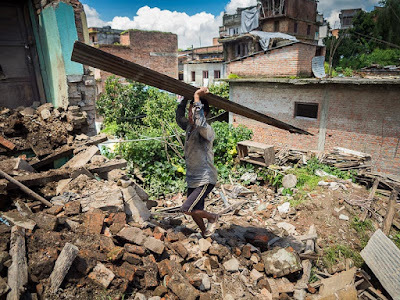 Don't come to Nepal with a hammer and saw and expect to rebuild homes. 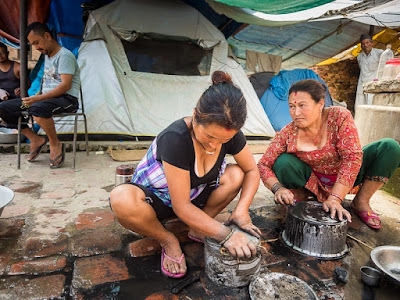 Every person who comes to Nepal with the expectation of providing unskilled volunteer labor puts a Nepali out of work. 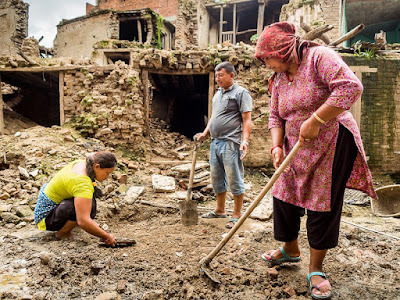 If you want to come to Nepal as a volunteer and don't have a specific needed skill set (for example, medical) you can do more good sending a financial donation to one of the organizations on the USAID list or coming to Nepal as a tourist. If you do come to Nepal as a tourist, please remember that the country just went through a horrific experience. Be respectful. Normally when I cover news event I photograph first and ask permission afterwards. When covering a disaster like this, I ask permission first then photograph. The people in my pictures knew I was photographing them and why I was photographing them. I carried a Fuji Instax (a Polaroid like instant camera) camera with me and presented most of the people I photographed with portraits I made of them when I finished. Finally, there are more photos of Nepal's rebuilding in my archive and available from ZUMA Press.